Could someone please help e, I am begging, 3 days and all frustration, FLIP OVER, FLIP UP, FLIP UNDER, printer dialogue conflicts with affinity dalogue when it comes to orientation, please help. Here are my screenshots, if anyone recognises anything at all that would be helpful I would appreciate it. I am pulling out my hair, buckest of coffee, 54 pages later, and xara is looking attractive right now but I don't want it really. I love indesign, never had spreadsheet printing problems like this, but really prefer affinity...Off to gulp more coffee......ready to pack it in.... Oh, it is an 8 page A5 booklet Portrait printed in landscape orientation. Your third image is almost identical to my post of 10:13 yesterday except printer type obviously and I used automatic orientation. Ignore any of HP's own settings except paper type and orientation and try printing from Affinity's dialogue box. Hi, yes to all that you have said. and I posted the Solution to everythig on another thread, "Printer dialogue ignored by affinity". (which actually this happens sometimes) but I have solved it. Gentlemen, this is a doddle in Designer. I produce such things all the time; set the job up as an A4 landscape, set up a guide at 148.5 cm, set up the borders and bleeds you need on each side, save it as 'Template' , open 'Template' and use 'Save as' to call it whatever you want. When you've finished each spread, save it, then Select All, then delete it; then 'Save As' and carry on with the next spread. I've attached a 4 page A5 brochure layout; for an 8 page you would have pages 8 and 1 for the outer, and pages 2 and 7 backing it up, then 6 and 3, then 4 and 5. A lot of talk in this thread, but I do NOT see an EASY SOLUTION that seems to work well for everyone. "File > Print Booklet..." in InDesign works perfectly and has since the days when that feature was but a mere plugin. Indeed, without that feature I would say InDesign is useless. As such, I would not use Affinity Publisher without a dedicated, easy-to-use feature that is similar to Print Booklet. I hope Serif is reading this thread. I've not see a single post by them in this thread, so perhaps they don't care? Seriously, a missing Print Booklet feature is a showstopper in my booklet. Have done several test runs with print booklet now and it works a treat, Windows 10 to colour laserjet. Mostly it appears to have been my fault, the printer settings were interfering with affinity settings, over-riding them for the most part. But that is the problem, everyone has a different printer, and its like colour management, switch it off in the printer otherwise it over-rides photoshop's workflow. So methinks that if people are having problems then the first port of call is to look closely at the printer settings. We need a consistent Print Booklet solution within Affinity Publisher that works for everyone, including Mac users, that does NOT rely on printer drivers. Adobe put “Print Booklet“ in InDesign for years for good reason. So should Affinity Publisher. Unless people post here their workflows regarding doc setup and then their printer driver setup do we know if there is any substantial problems with print booklet in affinity? And what about export to pdf and send pdf to printer (home printer), I am forced to used another pdf (having used adobe acrobat as part of the creative suite for years) and that pdf has a new setup that I have still to test. I fail to see at this moment, unless someone points out a particular setup) how affinity is failing, but then I do admt to being totally new to the affinity suite, (three weeks ). Various "Booklet Types" are offered by InDesign's Print Booklet feature, but "2-up Saddle Stitch" is typically the best choice when making 2-sided booklets that will be stapled in the middle. Say you create a design no B5 paper in the landscape position, creating 2 pages of content side-by-side for a total of 4 pages when considering both sides of the said B5 paper. 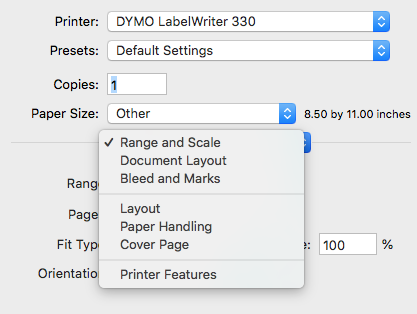 The "2-up Saddle Stitch" setting in InDesign will properly format the pagers for direct printing to your printer, with only minor printer driver setup required, and no PDF creation required. Print that way, then take the papers from your printer, staple them in the middle, fold, and you're done. No cutting or trimming required in my experience. It's really very easy and straightforward and consistent across all platforms and printer drivers. Again, you don't need any major fiddling in your printer's dialog box when using Print Booklet. You just need to make sure you have duplex printing and typically you will choose "Short-edge binding." Once that's setup, you then check the Preview in the Print Booklet dialog and ensure your cover page and back page are correct, and then it's typically safe to print. There are lots of guides and YouTube videos on InDesign's "Print Booklet" feature. Ten minutes or so of Googling, reading and watching will make the feature abundantly clear and hopefully clarify what the same sort of feature is greatly needed for Affinity Publisher to be taken seriously. Why does this matter? Because Serif needs to woo Adobe users away from Adobe. The easier you make the transition and the more complete the feature set, the more likely it is that Adobe users currently tied to the month subscription ball-and-chain will "see the light" and make the switch. But if the transition looks too difficult or if there are major features lacking, most Adobe users would probably justify the ball-and-chain price and stick with what works for them. So I strongly suggest that Serif add a Print Booklet feature to Affinity Publisher, post haste. JDW I take your point, but in all fairness to the Affinity suite I am sure options like this will eventually come along, I am no business person but my logic suggests that affinity' target audience at the moment is for the small business and the home business, the self employed photographers and self employed designers. It would take years and years for affinity to be competition for the larger businesses and the commercial world. I also believe, from experience, that affintiy has a huge market in the student world, while you used to be able to purchase the student edition creative suite for 250 euros as aopposed to 750, students would be a massive market for them at the prices they offer and the one time license. When I was doing a diploma studying photographic studies everyone wanted photoshop or indesign, but few could even afford the student edition. In view of this I think that Print booklet is as it now is has sufficient warrant for most users. It is still early days and it took at least 19 years for adobe to get where it is now, affinity is the best DTP platform I have come across at the moment under 300, (also ex pagemaker and quark express user from the 1990's). How on earth did we cope then without print booklet? So in general I agree with the substance of your statement but allowing for the fact that affinity has so much to work on right now to at least get the product ready for public consumption, the luxuries can be added step by step, then add those professional detailed Tutorials on LINDA com like they have for adobe (in iteself a great place to discover what's out there) - and it will take off very quickly. As I said, I am no business person, these are just my thoughts. Even if ttere were no print booklet option I would still use affinity and do it the old fashioned pagemaker way from 1993. I use InDesign's Print Booklet regularly for a few hundred of our publications, so I would be happy to see something more substantial in Publish. So in that sense, JDW, I get your point--I too would love to see that feature. However, I have done some testing, and I am able to get reliable booklet printing with Affinity Publisher as it is now. (It is actually one of the first things I tested, because I knew I would need to be able to print booklets.) Creating a proper booklet printing interface is probably a rather large task, especially once you have to deal with so many different printer types. I can imagine that it could be rather massive. I really don't think we could rightly expect that it should be ready for any of the version 1 releases, especially since they have a number of other essential (or as I read it so often, "show-stopper") features to implement. If Affinity Publish in its first release meets my needs otherwise but is lacking in booklet making, I would be happy to buy proper imposition software and still use Publisher for layout rather than continuing to hemorrhage money to Adobe for InDesign. Dedicated imposition software can be more capable than even InDesign's Print Booklet feature, so I might end up preferring it. Summary: I would like dedicated Print Booklet feature, but it is my opinion that it is more of a luxury than can be expected in the first version of $40-50 software. ... Creating a proper booklet printing interface is probably a rather large task, especially once you have to deal with so many different printer types. I can imagine that it could be rather massive. 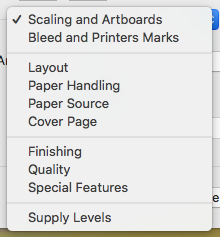 Setup shows you your printer preset (if any), Page Range you want to print, Booklet Type (2-up Saddle Stitch is most common) and related choices like Creep and Bleed, Margins, and whether or not you want blank spreads printed. That's it. To setup duplex printing requires you to click the "Print Settings..." button on that same screen, which opens the standard MacOS Printer dialog box in which you tweak your settings. So really, Print Booklet just ensures that pages print in the right order so the end result is a booklet, but all the hard work is still done by the MacOS printer driver and related dialog. 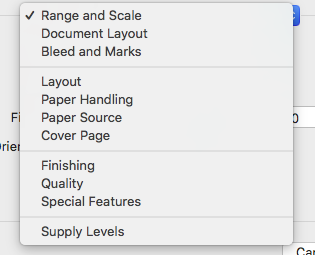 If there is anything "hard" about adding a Print Booklet feature to Affinity Publisher, it is for Serif to properly replicate 2-up Saddle Stitch, 2-up Perfect Bound, 2-up Consecutive, and other binding (print order) methods. But at first they could limit that to just the most popular -- 2-up Saddle Stitch and then add others over time. So again, I don't see the addition of this critically important feature as anything that would slow down development of Affinity Publisher. And seriously, without a convenient means to print booklets, why not just use Illustrator instead for designs of 10 pages or less? (Or in the context of this forum, Affinity Designer) Illustrator or Designer give you multiple artboards/pages. It may not be as elegant as a dedicated Publisher app, but it works. Indeed, I suspect that many Affinity Designer users have done just that while waiting for Publisher. So what I am saying is that if one argues for a long and troublesome method so as to avoid forcing Serif to add a Print Booklet feature to Publisher, I could easily arguing the slightly more troublesome yet usable alternative to Publisher -- using Affinity Designer. Print Booklet is to Affinity Publisher what a duplex unit is to a laser printer. Some people may not need it, but for those who do, you wouldn't want a non-Duplex printer to mass print your 2-sided masterpieces. Serif, please just add a Print Booklet feature to Affinity Publisher. If it wasn't needed, InBooklet never would have come on the scene when InDesign came out, and Adobe certainly wouldn't have spent time to add that as a standard feature when Quark bought InBooklet so as to kill it. It shouldn't be that much trouble to add it, since all the hard work is done (at least it is on a Mac) in the print dialog box. Print Booklet is merely a more convenient way to establish the proper print order of the pages in your document. JDW, what is it you actually want? This thread keeps asking for a print booklet feature, which Publisher demonstrably already has. To my needs, Affinity's booklet printing is already better than InDesign's, because it will actually let me export to a PDF, which InDesign's won't, instead forcing me to export a PostScript and then convert it in Preview! I guess you're actually after the different binding settings? But since I only ever used 2-up Saddle Stitch in InDesign I don't really know what the others do. 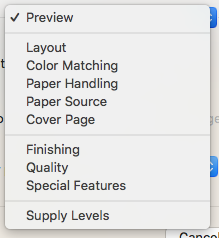 Is the 'Book' setting in Affinity Publisher equivalent to any of them? Click on the popup which says "Range and Scale" and choose "Document Layout"
Click on the Model popup which says "Single" and choose "Booklet"
Seems easy enough, right? Well, yes... sort of. The above steps are consistent and work for the Mac under High Sierra, but I expect those settings may change with the print dialog. One cannot follow precisely the same steps on Windows either. I suppose I could just join hand-in-hand with others and cry, "well, the current method works well for ME on MY computer right now, so I won't worry about other platforms or the future or a consistent UI for booklet printing that is cross platform and will never change with the OS version." But I was trying to be a bit more open-minded on the topic and therefore suggested a dedicated Print Booklet UI that would be the same for everyone and would also be familiar to those who have used InDesign. As you have noticed, there is also the issue of other binding options which InDesign offers and which are not necessarily offered in the Print Dialog's "Model" popup. But hey, it doesn't affect me so "why should I care?" right? As to PDF printing, I myself have never had the need to create a PDF in booklet form because printing firms I've used typically will take the InDesign file as is. So when I do need a PDF, I need a normal PDF that would be viewable on a website, in which case you wouldn't want it in booklet form. But my own use-case aside, Affinity Publisher does offer the ability to create a PDF in booklet form which is a boon to those who need it, and therefore Affinity Publisher is to be praised for offering that feature. And that's the thrust of what I've been writing. Even if I myself don't need a particular feature, I am pleased it exists for the benefit of others and for my own self too should I require such in the future. To end my thoughts on the matter, so long as most Publisher users can enjoy using the current printing features cross-platform, that's all that matters. The above steps are consistent and work for the Mac under High Sierra, but I expect those settings may change with the print dialog. One cannot follow precisely the same steps on Windows either. Well, yes. As they should. I want my Mac software to feel like modern Mac software, not like something built for System 7, ported to Windows 95 and then ported back to Jaguar and not updated since. Print options belong in the Print dialog, which should be consistent throughout the OS. I hate that Adobe's isn't. If it's specific binding options that you want, then I'd suggest creating a new thread, naming what you're looking for in the subject line. This thread has got confusing, with too many people seemingly wanting for contradictory things, or things that already exist. Like I said, I don't use the other bindings, so I don't know much about them. But I suspect you'd have a far better chance of getting noticed by the devs in a dedicated thread. I think there is some misunderstanding here. It is true that Affinity is working within the standard print dialog box (which sometimes I wish Adobe would also do -- I still can't send jobs of more than 999 copies, even though I can in basic apps like Preview). BUT, they are using the application specific section. 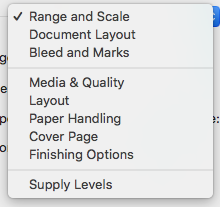 The "Range and Scale," "Document Layout" and "Bleed and Marks" are specific to Affinity Publisher. This is not dependent directly on either what macOS provides or the printer driver. Again, that is an entirely different print driver, but the same three options specific to Affinity are there. You can be sure that it wasn't DYMO who gave us the option to print booklets onto a roll of 1⅛ x 3½ labels, yet the option is there--because Affinity provides that option, independent of the print driver. I appreciate this thread, because it has forced me to think it through, and in the end, I think Affinity is making the right choice to work within the paradigm of the operating system. (I would be interested to know how this is handled in the Windows version.) Sure, a few of the options could be fleshed out (for example, creep in booklet mode - and what is the difference in book and booklet modes?). But those things can be added within the framework that Serif has already established in these betas, and I think working in the standard dialog box is the wise choice. InDesign's implementation tries to rewrite their own print dialog box to some extent, and despite what must have been a massive effort, it is buggy. To give just one example, with the latest drivers for our printer, I have to save as PDF or PS and then print from the lowly Preview instead of printing directly from InDesign. I must do this anytime I need both offsetting and a cover page taken from a different paper source. 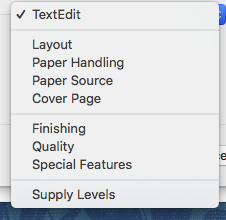 From InDesign, if I try to use those settings with multiple copies, it sends the job as though it were one really long document rather than multiple copies of a normal document. It takes a long time to send to the printer (like half an hour), and then when it prints, it treats it as one really long copy, with exactly one cover page and offset exactly one time. I have used these same settings in InDesign with previous drivers without this problem. But those are the kinds of things that happen when they try to go maverick. To give another bizarre example, Safari's print dialog box is also somewhat custom. Although it is styled to mostly look like the standard implementation, it does not respect Apple's own convention. Not only are the options moved around from everything else, but there is a persistent bug that I reported more than seven years ago—when I was on a different computer, different operating system, and I had a different job in fact with different needs—where it will not respect paper margin settings. To specify a margin in Safari, you have to first go to System Preferences, create a custom paper size with the desired margins, and set that paper size to the default. Thank you, Serif, for not messing with these things. "And does anyone know the difference in "Book" versus "Booklet" in that setting?﻿"
In "booklet" it produces a single signature, that is to say if you print 12 pages on three sheets of paper you can simply fold the bundle in half, staple and lo! you have a booklet. Now what you would hope for in Book is that it would print multiple signatures as that's how a book is bound - basically a stack of booklets sewn together. So if you had three sheets of paper per signature in would print pages 1-12 in the first stack of three, 13-24 in the next. Unfortunately AP seems to assume there is but one sheet per signature so you get pages 1-4 on one sheet (printed 4-1-2-3), 5-8 on the next, so it's a book, but with only one sheet per signature. Hello, many thanks for great Beta Publisher, I really like it. For my purposes, I will appreciate advanced print settings and the export of brochures, mainly creep setup, etc..
Also multiple image placement will be useful. 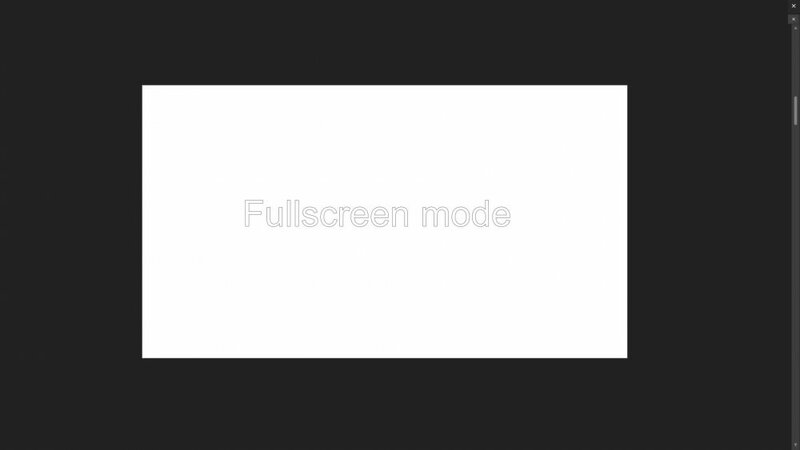 And fullscreen preview mode without any side bars will be nice. Thanks for your feedback/suggestions. The video link you posted leads to an unavailable video page so I'm not sure if the following will cover all the features you are requesting: how to add multiple images in Publisher. If you press TAB in addition to ⌃(ctrl) + W (menu View ▸ Preview Mode) Affinity Publisher will hide all the tools/panels leaving just the canvas/project visible. There's no problem with link in my browser, but you can find it on youtube with "Indesign multiple image placement - masonry grid effect". Its about quick placement of many images by clever grid. I thought.. fullscreen mode with no main bar above and system bar below the page. For me Its useful for quick clear undisturbed preview of the document without export to PDF. 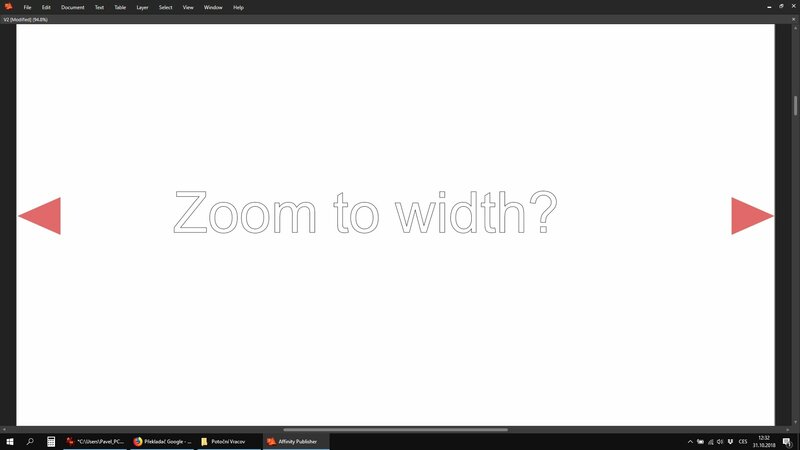 I also found that Zoom to Width in Preview mode doesnt work correctly. There are gaps on sides. So its not usable for "like-web browser" preview. Yes, it's the video that I thought, thank you. I have an OKI C531dn colour laser printer which OKI cannot be bothered to make a MacOS Mojave for, so I really struggled to print an A5 booklet on A4 landscape. Eventually, after many frustrating hours, I saw the post from captain_slocum about "Create Booklet" and downloaded it. After I installed the relevant add-on (included) to provide an additional printer option within the 'Print as PDF' dropdown, I now just design the booklet in Affinity Publisher, click on "Print" and select "Open in Create Booklet" from the PDF option. It even reminds me to check that duplex printer binding is set to "Short Side"! Click print and there's the booklet, ready for stapling - BRILLIANT! That's solved my problem, although I accept it involved the purchase of an additional app. I would expect APu to be able to print anything that it can design, so I'm looking forward to native booklet printing down the line - not too far down the line, hopefully! The previous post seems to show that relying on a "printer driver" is not always a solution to print booklets in Affinity Publisher. Disclaimer: I've never used the software myself. I'm just posting the link. I'm as frustrated as everyone else with the lack of a simple feature that worked very well with pageplus. However, I seem to have had some minor success in exporting an A5 booklet by doing the opposite to what you imagine i.e. unclicking the "facing pages" box in document setup before exporting to PDF. There was some minor fiddling with the print set up in acrobat to get the print to look ok - but the only reason I export to pdf is to get someone else to put it on pager.